Salvation for rough, dry hands. 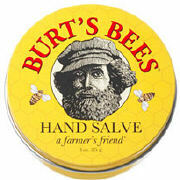 Burts Bees most intensive hand treatment, this formula is packed with botanical oils, herbs and beeswax to moisturize hard working, rough, dry hands. It's an everyday miracle. Apply salve to your hands as often as needed. Burts Bees products are Earth Friendly, Natural Personal Care Products. Carefully crafted from time-tested, proven recipes using ingredients that are the best nature has to offer: beeswax, botanical and essential oils, herbs, flowers and minerals.